When do I need to add my teenage driver and list them on the policy? Is it when they obtain their permit or when they obtain their license? Your child may drive your vehicle under their permit while they are accompanied by you and do not have to be listed. The day they are licensed you need to call your agent prior to letting them drive to list them. The agent will need their full name, date of birth and license number in order to add them. They will either be listed as an occassional or primary driver. If you prefer for them not to operate a paticular vehicle you can exclude them from that vehicle. What is umbrella liability insurance and why do I need to carry this coverage? Umbrella liability coverage is an overlay coverage that provides limits in $1,000,000 increments above and beyond your current underlying limits. In most cases you have to carry at least $300,000 on homes and boats and $250,000/$500,000 optional bodily injury and $100,000 property damage on all vehicles. You should consult with your agent to see what your paticular company requirements are. The coverage is designed to provide additional liabilty coverage in the event of a catastrophic liabilty claim. Most companies charge around $120.00 per $1,000,000 increment for a home and two vehicles. The more exposures you own, ie, second homes, boats, additional vehicles and youthful operators the premium can increase. Every homeowner should carry this important coverage. What is the difference between un-insured motorist coverage and under-insured motorist coverage? Un-insured motorist coverage protects you against vehicles on the roadways who are un-insured. Under-insured coverage protects you as well but is designed to provide coverage over and above those of an under-insured driver should our claim exceed their limits. In difficult economic times and in general some people opt for very low liability limits. In New Hampshire automobile insurance is optional so our agency protocol is to recommend a minimum limit of $250,000 per person $500,000 per accident for un-insured and under-insured coverage. Consult with your agent to see what the best limit for you is. When insuring my home, how important is it to carry full replacement cost on both dwelling and contents? Our agency has a protocol of recommending guaranteed replacement cost on dwelling and replacement cost on contents including all risk coverage. By carry this coverage you are only responsible for your deductible which is generally $500 to $1,000. Some companies based on the age of the home usually built prior to 1925 will only offer a capped replacement cost of 125% or 150%. Some companies don't have the ability to provide replacement cost on older homes. If you can purchase it guaranteed replacement cost is the best because it is a no cap contract. 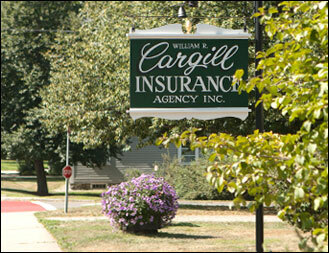 The carrier will rebuild your home regardless of the amount of insurance you carry under coverage A. You will need to insure to 100% of the appraised replacement cost of your home but we strongly recommend this coverage to all of our clients.